Relive the 2014 season. Watch full game archives of every 2014 regular season and Postseason game. PLUS watch the Japan Series LIVE online November 11-20, 2014 and watch select Spring Training games beginning March 2015. 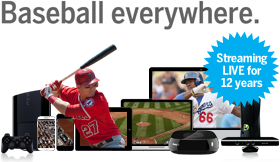 MLB.TV subscription will expire on or about April 4, 2015 and will not automatically renew. Regular Season Local Live Blackout: All live games on MLB.TV and available through MLB.com At Bat are subject to local blackouts. Such live games will be blacked out in each applicable Club's home television territory, regardless of whether that Club is playing at home or away. If a game is blacked out in an area, it is not available for live game viewing. If you are an MLB.TV subscriber and not within either Club's home television territory, the applicable game will be available live and as an archived game as soon as possible after the conclusion of the game. If you are an MLB.TV subscriber within either Club's home television territory or an MLB.TV subscriber in any territory, the applicable game will be available as an archived game approximately 90 minutes after the conclusion of the game. These blackout restrictions apply regardless of whether a Club is home or away and regardless of whether or not a game is televised in a Club's home television territory. Regular Season Weekend U.S. National Live Blackout: Due to Major League Baseball exclusivities, live national broadcasts of Major League Baseball events, such as the All-Star Game, and live national broadcasts of MLB games occurring each Saturday with a scheduled start time after 1:10 PM ET or before 8:00 PM ET and each Sunday with a scheduled start time after 5:00 PM ET will be blacked out in the United States (including the territories of Guam and the U.S. Virgin Islands). In addition, in the event of circumstances that produce a programming conflict or change in schedule, the above blackout windows may be subject to change. If you are an MLB.TV Premium subscriber outside of the United States, each of these games will be available as an archived game as soon as possible after the conclusion of the applicable game. If you are an MLB.TV Premium Subscriber within the United States or an MLB.TV subscriber in any territory, each of these games will be available as an archived game approximately 90 minutes after the conclusion of the applicable game. MLB.TV Postseason Live Blackout: Due to Major League Baseball exclusivities, during the MLB Postseason, all live games will be blacked out in the United States (including the territories of Guam and the U.S. Virgin Islands) and Canada. If you are an MLB.TV Subscriber outside of the United States and Canada, each of these games will be available live and as an archived game as soon as possible after the conclusion of the applicable game. If you are an MLB.TV Subscriber within the United States or Canada or an MLB.TV subscriber in any territory, each of these games will be available as an archived game approximately 90 minutes after the conclusion of the applicable game.